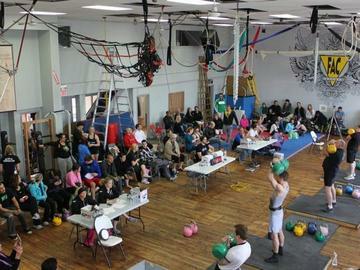 On October 21, 2017, The Toronto Kettlebell Club at Fighting Arts Collective will host the AGATSU TORONTO REGIONAL KETTLEBELL SPORT AND MACE COMPETITION. Ranking the provided KETAcademy Universal Ranking Tables 2017. SPACE AND TIME IS LIMITED. DON’T MISS OUT AND REGISTER BY October 11 (earlybird by September 30). Competitors may enter in two official events and one fun event per registration. Participation in additional events will require an additional registration. From the upright position, lifter back-swings the mace through a complete rotation. Repitition is counted when lifter’s hands reach a controlled stop in front of, or below, the lifter’s navel. SPACE AND TIME IS LIMITED. DON’T MISS OUT AND REGISTER BY October 11. Please note that all competitors are expected to know and fully understand the rules of the competition. A competitor who fails to perform any lift without meeting the necessary performance guidelines outlined under the rules may receive a "no-count." It is the responsibility of every competitor and coach to properly prepare to perform according to the competition rules. **When you register please include the event or events that you will participate in. Also include which Kettlebell weight you will lift along with the bodyweight category you will compete in.